Day-to-day life of the Leaf. Like a form of diary then? Six years after Nintendo unveiled the unique Wii console to the world with its fancy motion sensor controller dubbed the Wii Remote, the Japanese games manufacturer has devised a new way of interacting with video games by enhancing the user experience with the new Wii U. The GamePad controller, featuring a large 6.2-inch display, camera, speakers and motion sensors feels like a chunky iPad. And yet it’s very comfortable to hold and use, as it’s not too heavy thanks to the Nintendo’s approach to ergonomic design. The game playing features are taken directly from the popular DS and 3DS handheld consoles, whereby you have physical buttons (like the D-pad) and a touch screen to interact with. Playing games with the GamePad is a joy as it brings a new sense of perspective and experience. Nintendo Land in particular shows off the many features on the controller by tilting, rotating and touching the screen to aid the fun and addictive game play. While survival horror game ZombiU uses the GamePad as a form of a scanner to look for items as a way of staying alive from the zombies. As for the Wii U, this is the first time that Nintendo has gone for the High Definition route and games now look absolutely breathtaking on a HDTV. New Super Mario Bros. U is a great example, as the environments look even more immense and lively thanks to the gorgeous visuals. And yet the feature I love the most about the Wii U is the social network. The Miiverse reminds me of a combination of Facebook, Twitter and an online forum. You can post status updates on games with text messages or drawings that everybody on the Nintendo Network can see. Players can ‘follow’ one another and rate status updates with ‘Yeah!’ approval. In addition, if you are having a difficult time on a level, just post a message on Miiverse about your troubles and a solution on how to complete it is given by the helpful players online. This social interaction makes the Wii U really unique. Instead of the usual online competition to be the best against the rest, there is a sense of networking and embracing your online friends. It feels friendlier and you get to see the different personalities thanks to the witty messages and drawings. Is this Nintendo’s finest console? The HD visuals do make the games look fantastic and thanks to the powerful processors, the Wii U can finally match the capability of Sony’s PlayStation 3 and the Xbox 360 from Microsoft. As for GamePad, the touch screen elements work very well in the games on offer in particular Batman: Arkham City Armoured Edition. Although it will be fascinating to see developers creating new and exciting ways to harness the GamePad and the system’s other unique options to deliver one-of-a-kind experiences in the years ahead. Well as you know, my reviews here are pretty much exclusive of older films. So with that in mind, here’s a film from 2009! Staring Quinton Aaron (Michael Oher) and Sandra Bullock (Leigh Anne Touhy) who won an Oscar for her leaden role in the film. Based on a true story, the film follows the story of, big friendly and slow black giant from the projects in Memphis Tennessee. With little education in his life, does not know his father and his mom is a crack addict, life is not nice for Michael. By chance, he is given a a place at a Christian school by their football coach who sees Michael as their star defender. Being a huge late teenager starting in a class with kids barely in their teens, life is at first hard for Michael at his new school. However little child, S.J Tuohysees the giant as a lost soul and make friends with the big guy. One wet, cold night, while making his way to the gym or as he knows it “home”, the child’s parents chance upon Michael and give him a roof for the night at their sizeable home. One night turns into weeks and slowly but surely they build a bond between them and realise his talent for defending not only in football but in life itself. The key to his future though relies on him needing to graduate and so hires a private tutor (Kathy Bates), a role no doubt helped by that fact she was born in Tennessee. At first though despite his size and protective nature, he does not do too well at football and his coach has no clue how to teach the giant bear how to play the game. So in steps Leigh Anne and shows Michael what he needs to do in the only way he can relate to, from there on in football is his future. He ends up being the the first draft pick for the NFL in 2009. So that’s the basic outline and I have to say I love this film. I hate to use the term “feel good film”, because, well, in most cases it’s a film and people watch films as an escapism not as a guiding light. But given that this is based (fairly strongly) on fact I can see this as a feel good film. Not that most can benefit from it and make a change for the better (that’s what I call a real “feel good film/documentary”); however it is a film that lifts the spirit and even shed a tear for sadness growing into joy. As mentioned, Sandra Bullock won the leading actress for her role. I’m a HUGE Sandra fan, but she’s a very hard cause to fight for. Ever since Speed, much of her film career has been stinkers, but I can’t help but love her. However, in this she does play a blinder of a role, akin to Julia Roberts‘ role in Erin Brockovich though I think Julia did far better than Sandra. There are big similarities, being a strong based-on-fact woman and a role vastly different from their norm. Both are incredibly good looking for their age, however Julia certainly pulls of the push-up bra better than Sandra does in this film (which must surely have been deliberate). But, and this is a big but, it was fantastic to see Sandra actually work for her money. To see her in this role proves that she has been a wasted talent and I would assume she hasn’t had many roles like this given to her. I can only imagine she leapt at the chance to be in this film. Sadly it seems, it’s not been a case of a career revival and has been given more roles like this. The big centre point in this film is the deep south of love, of God and with Christianity overcoming racism. At points the black card is played and is better dealt with in some scenes than others, but given that allegedly the real Tuohy’s applied a big part in this adaptation, time constraints played more than their part in this. Credit has to go to the other members of the family who make this feel like a great household to depart of. Much credit has to go to Jae Head. His closeness to Michael looks and feel genuine as the whole family takes this stranger and make him instantly a part of the family. Their religion is never forced down are throats as actually Christianity per se, but having not read the book, this is possibly Hollywood glossing over a few aspects of the real events. Overall I really liked this film, while it was obvious it was “Sandra’s time” at the Oscars she has not moved much from the rom-coms since, she played a great role as does Quinton in his. This makes for defending the Sandra Bullock Fan Club a harder cause to fight for. After the massive disappointment of Johnny English Reborn which was watched immediately preceding this, it was a great watch. At least, I have added a nice background image to give it a sense of identity. The words of my favourite films, television shows, music and Formula One drivers form the shape of a racing car! Clever bit of typography that. Right, be sure to follow me @walkingleaf79 and I will try my best to ‘tweet’ any random thoughts or news items I have discovered on the net. The Cobb BBQ really is the ultimate in portable BBQs. This thing goes anywhere you can and even carried there while cooking on it! Originally developed for use in Africa, it meant people could cook in rural areas without electricity and minimising the risk of causing fires using dried corn cobs for fuel. Since it’s inception, it has been developed and improved and is now a world wide success. Needing only a few charcoal briquettes or just a single Cobble Stone, this is more than just a BBQ. It’s a portable cooking system with the ability to smoke, fry (stir and griddle), grill, bake and even make pizzas on. It’s unique design means you can put it anywhere and even pick it up while cooking, thanks to it’s stay cool sides and base. The heat source is isolated within the base so there is no direct contact to the outside of the cooker. There really is no limit to what you can cook on this, from the usual burgers to whole chickens and joints. Around the where you add the briquettes is a moat where you can add water, beer or wine to keep your food moist or add flavour. The moat also acts as fat collector as the bundled grill grid is slightly dome with holes around the edge, so any fat can run off into the moat. This means there are no flare-ups and little smoke, so you can even use this indoors! You can also add veg or small potatoes in the moat to cook so a proper Sunday roast can be made on this thing. Right, that’s the story, now what is it like, really. Hah! It’s awesome! Having done all manner of things on it I can confirm this is brilliant. As I mentioned, this is more than just a BBQ, it’s more like a charcoal oven (as described by The Hairy Bikers). Using the lid is essential for cooking most things, due to the fact that your only using a few briquettes it needs the lid to create the heat needed. During the first few uses, means you must suppress the temptation to keep checking the food. However the flip side to this is it makes for a more sociable cook, as you can relax and have a drink or more with your friends and family. My first attempt with the Cobb was jacket potatoes and the Cobble Stone as the heat source. The Stones are made from Bamboo and wood, which come as a single round brick that fits perfectly in the heat rack. Just light, wait for 4-5 minutes and your ready to cook with enough heat for 2 hours. Having just microwaved potatoes for a few minutes to give them a head start, they were drizzled with olive oil and sprinkled with rock salt and wrapped in foil. Using an additional grill rack that sits onto of the holed grill, allows the food to suspended above the heat just like a traditional BBQ. With the lid on about 60 minutes later then were done to perfection. Crispy skins and hot fluffy insides, nice. Further attempts were the usual affair with burgers, sausages and the like. All came out great and using some cherry tree wood chunks placed on top of the Cobble Stone gave them a great taste, though it does mean indoor cooking is a no-no due to the smoke. My most recent use was the big one, a whole chicken. Seasoned with some rub and stuff with a lemon and rosemary with wine poured into the moat. Cheap wine is only required given the amount needed and primitive requirements from coking with it. Fearing the time needed to cook throughly, I used some highly recommended Australian Heat Beads. These burn very hot for a bit longer than the Cobble Stones, it is also easy to add more if needed. Around 80 minutes later the chicken was excellent, being flavoursome, moist and well cooked. Make no mistake, this is not a party cooking machine. Being portable means it’s not got the biggest cooking area and needing to keep the lid on, means en masse cooking needs a bit of organising. But that’s not the point of the Cobb. So, up to this point, there has been no failures, just great food. Bad things? Well yes there are a couple. By the time you add all the accessories it’s not cheap, £200 nearly for everything in the range. There are five cooking pans if you will and I have and want to use all of them, then the bamboo chopping board is great as you can put the meat on it to rest with the lid on top to keep wee beasties out. The board has a groove around the edge so the lid sits perfectly on without sliding should you need to move it. I didn’t get it at the time, but you can get an extension to the lid so you have more room inside to cook bigger chickens etc, and that is needed also in my opinion. The other bad thing is cleaning it. On a traditional BBQ, you’ll probably just clean the cooking rack and that’s it. Here, you need to clean everything and since it’s a cooker (BBQ that means grease) oil, burnt bits and all. While it’s not too bad at home with hot soapy water and a wire scourer (it’s also dishwasher safe), camping out will require hot water. Just in a tent in a field? Hmm not so good. But overall, I just love it. I’ve always wanted a proper smoker, but most are too big and if you only want to do a chicken or some ribs, it s bit overkill. So this is perfect to smaller things, is very easy to use and given it can go anywhere, cleaning aside, very practical. Highly recommended indeed. I went to see one of the most famous metal rock band in the world, Metallica, at the former home of the Millennium Dome this month. The gig itself was simply spectacular with impressive fireworks, lighting effects and of course, the epic guitar solos from the band. The O2 Arena itself was also amazing as I’ve never been to the Millennium Dome before. The sheer number of bars, shops and restaurants at the venue heavily distracted me. So much in fact, I’ve missed one of the support bands on stage! Not to worry of course, as I had a seat allocated for me. In one particular bar, a special tournament was being held offering the chance to play the new Guitar Hero: Metallica video game. I didn’t have the opportunity to play the music rhythm game, as it was more fun watching the other people performing on stage to the ultra tricky Metallica songs! 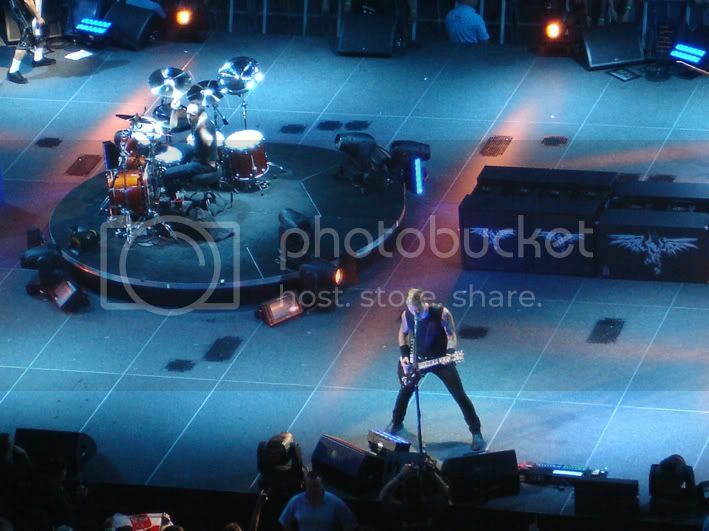 As for the real deal, it was fantastic to see Metallica performing their greatest hits in front of thousands of enthusiastic Metallica fans. The atmosphere was electric and I loved every moment of it! 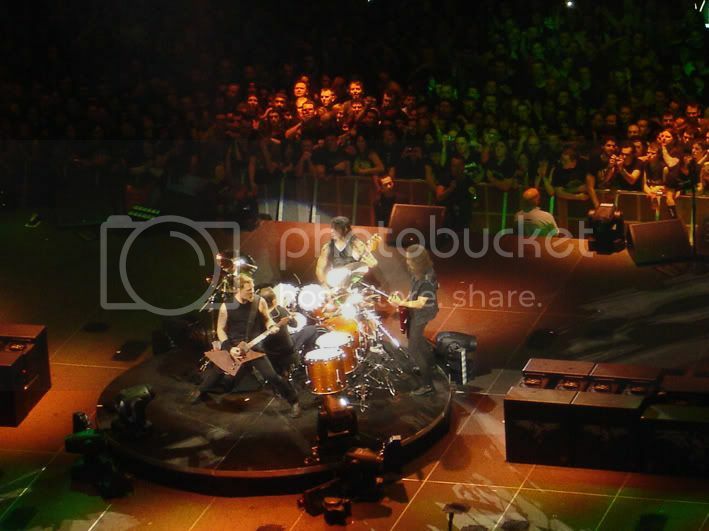 The highlight was Cyanide, The End of The Line, One, Master of Puppets and of course, the epic Enter Sandman. After the two-hour performance, I was left feeling more. 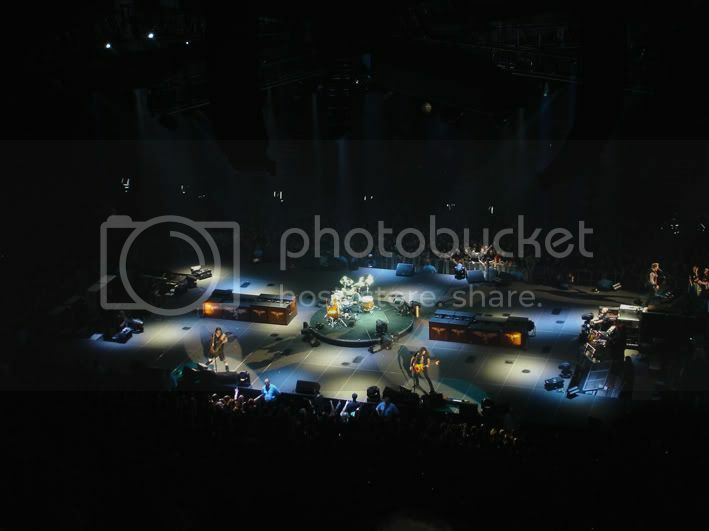 And thanks to this ace link on the official website, you can now download the complete set list. I would recommend the FLAC format for the true sounding experience! My annual visit to Birmingham’s NEC to attend the Autosport International Show is often the highlight of the new year. As this is my opportunity to meet up with my good friends and see some racing cars/stars up close and personal. The high point was of course was the F1 Racing stand and unique for this year, a special car display celebrating the past British Formula One world champions. From the likes of Jackie Stewart’s Tyrrell, James Hunt’s McLaren, to Nigel Mansell’s Williams and Lewis Hamilton’s 2008-spec McLaren. It’s amazing to see these cars all in the same area and it is fascinating how the advancement in technology and aerodynamics has changed the shape and look of the cars over the past five decades. Another highlight was the David Coulthard stand, featuring a collection of the Scotsman race cars. Seeing DC’s little go-kart alongside his Formula Vauxhall and Williams-Renault is amazing and you have to wonder how much all these cars, race suits and helmets cost… I wasn’t surprised by the amount of extra security protecting the DC collection from the public. Unlike my last visits, I wasn’t able to attend the Live Action Arena, as there was a mishap in purchasing the tickets. It didn’t matter anyway, as I spent this free time wandering around, taking photographs and asking for autographs from the racing stars. This year’s Pistol Head performance car show was quite low-key. Instead of a large collection of exotic supercars, this year it was all about the BMW M3 and Porsche 911. In fact, the whole Autosport show felt downscaled. The new layout didn’t help and after visiting the main attractions, you are left with little else to see… Which is a shame, as past events made this annual trip to the NEC worthwhile. Still, at least I came away with some free stuff given out by those promo girls. So I shouldn’t complain too much! 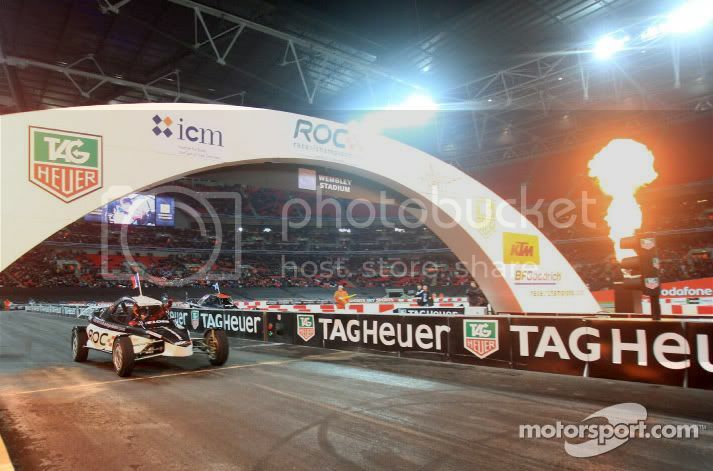 Back in 2007, I went with a group of friends to see the Race of Champions at Wembley Stadium. The event was really entertaining as seeing the world’s best drivers from different disciplines of motor racing, competing in evenly matched cars, around a figure-of-eight circuit was a real highlight to the end of the year. So for 2008, I invited some more friends who have yet to experience this sporting event and even though I purchased cheaper tickets online, the view from our seats was better than the year before! From our seating position, you can see all of the track and with the competition so close, the atmosphere made the event felt more like a football match than a racing contest. Just like last year, Team Germany won the Nations Cup thanks to the driving talent of seven times Formula One world champion Michael Schumacher and Grand Prix sensational Sebastian Vettel. In the main event, it was world rally champion Sebastien Loeb who took the honours, but the Frenchman had to fight hard against David Coulthard in the final. In addition, DC managed to damage his race car throughout the night, including his Red Bull Racing Formula One car! During his demo run, the Scotsman performed a ‘doughnut’ but as he was spinning around creating lots of smoke and noise for his fans, the car was slowly edging closer towards the wall…The inevitable happened and I still remember the crowd reaction when the front wing got knocked off against the barriers! Speaking of demonstrations, the pre-event promotional was the ‘man versus machine’ challenge with British Olympic winner Chris Hoy racing his bike around the track against British Formula One world champion Lewis Hamilton in his McLaren. Unfortunately, due to the icy track conditions the organisers decided to cancel the event and instead put Chris and Lewis in an open-top Mercedes and perform a parade lap in front of home crowd. It was a real shame, as I wanted to see this duel but Chris had the last laugh as later that evening, the Olympic hero was made BBC Sports Personality of the Year, beating his rival Hamilton! So a great day out at Wembley and I was pleased to hear that my friends loved every moment of it. The on-track entertainment certainly kept our enthusiasm up despite the winter cold and we look forward to attend the next Race of Champions.